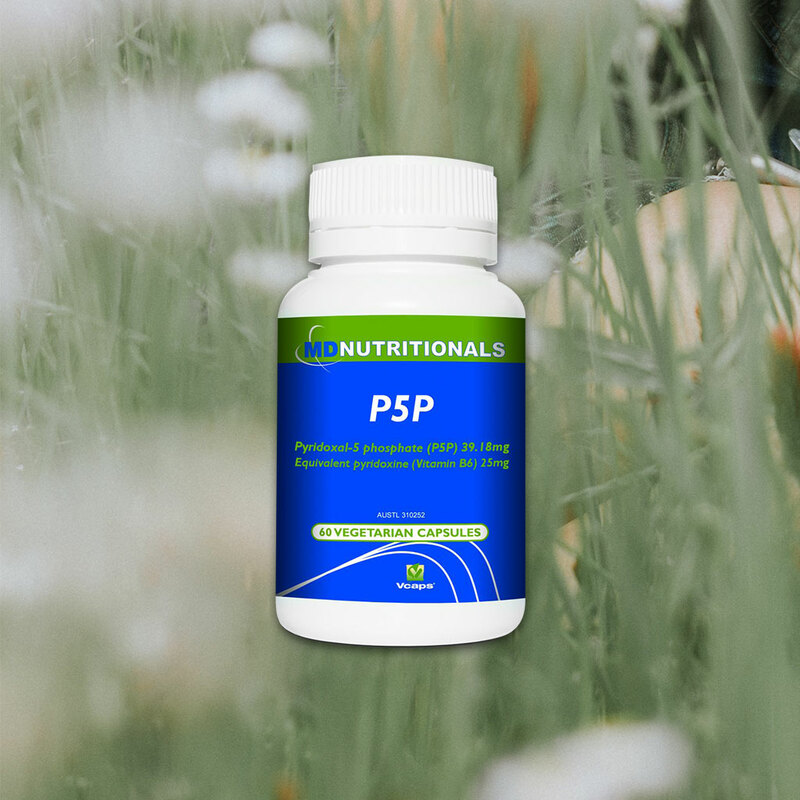 P5P supplies pyridoxal 5-phosphate (P5P) to support nervous system function, healthy red blood cell production, and reduce homocysteine levels. Pyridoxal 5-phosphate (P5P) is the activated form of vitamin B6. Standard vitamin B6 supplements such as pyridoxine hydrochloride must be converted to P5P by the liver in order to be effective. In contrast, supplementing with P5P ensures the most bioactive form of vitamin B6 is supplied. Within the central nervous system vitamin B6 assists synthesis of neurotransmitters. This includes the formation of serotonin, dopamine, norepinephrine, and gamma‐aminobutyric acid (GABA). Due to the central role in neurotransmitter synthesis P5P helps maintain nervous system function. P5P may support emotional wellbeing, and relief of symptoms of stress and mild anxiety. Vitamin B6 is involved in red blood cell production and may assist haemoglobin synthesis. Haemoglobin is the protein inside red blood cells that carries oxygen from the lungs to tissues and organs in the body and carries carbon dioxide back to the lungs. Testing for haemoglobin is used to check for conditions such as anaemia. P5P helps reduce homocysteine levels. Homocysteine is an amino acid produced via demethylation of dietary methionine, which is abundant in animal protein. In the presence of sufficient methionine, homocysteine is converted to cysteine through the sequential action of two P5P-dependent enzymes known as cystathionine beta synthase (CBS) and cystathionine gamma-lyase (CSE). Studies show raised blood levels of homocysteine is an independent risk factor for cardiovascular disease. Vitamin B6 may relieve morning sickness. Vitamin B6 may relieve symptoms of premenstrual tension.